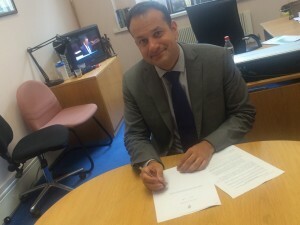 Minister for Health Leo Varadkar has signed new regulations to prohibit sunbed business operators from advertising, promoting or offering the sale of sunbed sessions in sunbed premises for minimum periods of time. “These Regulations are an important addition to the prohibition of certain marketing practices which I introduced in March this year when offers and promotions of free of charge, half price, happy hours or early bird offers were also banned. These new measures prohibit sunbed businesses from advertising, promoting or offering the sale of sunbed sessions on condition they can only be used for a minimum amount of time. These practices not only incentivise the additional use of a sunbed but actually force the customer to use a sunbed for longer than they might have originally wanted which is not only non-compliant with the Act, but also goes against the spirit of the legislation,” Minister Varadkar said. These marketing practices were discovered as part of the Environmental Health Services ongoing compliance building and implementation programme of the new sunbeds legislation. “As I have said previously, the more someone uses a sunbed, the higher the risk they will get skin cancer. The incidence of skin cancer is increasing faster than any other type. More than 850 new cases of melanoma are reported in Ireland each year, with 150 Irish people dying annually. So it is important that we protect the public from any incentives which may encourage them to use sunbeds,” Minister Varadkar added.  The advertisement, promotion or use of a sunbed unless the price per minute is shown in the advert in the same font, colour and size as the price that applies in respect of any other promotion in the same advert.